Gail Victoria Braddock Quagliata is a photographer in Brooklyn who has taken on the task of capturing every bodega in Manhattan. Her photos, along with a map, are featured on a webpage with the same name: Every Bodega in Manhattan. I asked Gail a few questions about her project. Q: Why photograph every bodega--what's important about the city's bodegas? A: When I moved here from Chicago a decade or so ago, the bodegas were among the first features I appreciated as unique to this city. We don't really have them where I come from, it seems to be either chain convenience stores or grocers. The bodega seems to cater specifically to its own neighborhood in addition to carrying basics. I've seen home-cooked Dominican food for sale in a largely Dominican neighborhood, religious tracts on prominent display near an Islamic center, and caviar advertised off ritzy 5th Ave, all crammed in next to cigarettes, flowers, diapers, beer, tiny overpriced bottles of aspirin. Plus, many of these shops are open 24 hours, so you've sort of got a perfect mini-metaphor for New York--the bodega never sleeps and is its own melting pot of cultural influences. Watching these unique places get shuttered as 7-11 stores spread is, in my mind, like watching every random corner pizza shop turn into a Sbarro. 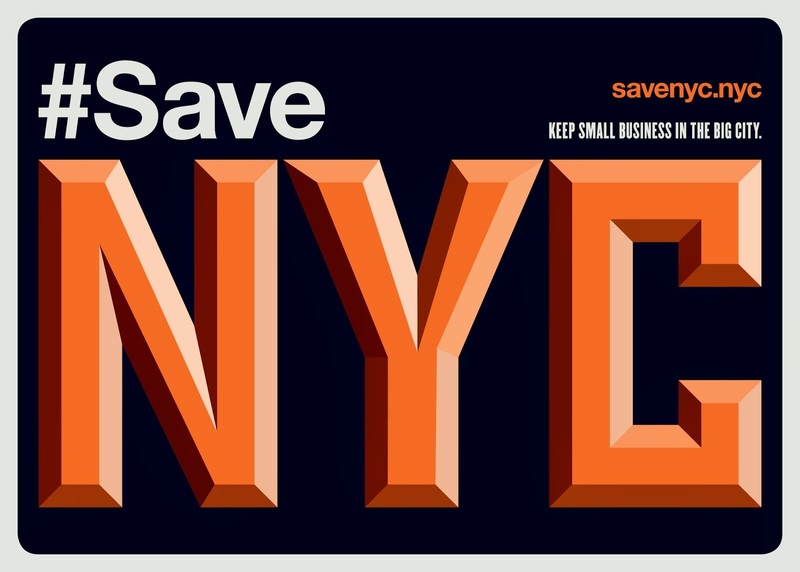 Another piece of New York's specific identity is blotted out, to what end? So we can be a boring, homogenous strip mall like anywhere else? Why would anyone want that? Q: What interests you visually about the New York bodega? A: Visually, I'm fascinated by how differently each bodega presents itself in spite of essentially selling the same thing. Right now, you'll typically see that Arizona Tea ad, "I heart big cans," which has somehow inserted itself onto the exterior of an absurd majority of bodegas, and probably the NY Lotto logo, but other than that it's a completely unique collage of ads and products crammed into or onto the windows. They're usually quite colorful just because all of the advertisements are competing for your eye at once, or the packages of the products in the window make an interesting pattern, or there are flowers just...being flowers. I'm also interested in the signs, the surprising lists of goods printed on the awnings, the names of the shops themselves. I realized I'd spent much of my time here not realizing what my own neighborhood bodegas have been called because they're just THE shop on the corner, period. Many of them have quite curious names. Then you'll hit a neighborhood where nearly every shop will have some permutation of the same name. Up near Columbia Presbyterian you practically can't walk a block without hitting a Presbyterian Deli of some stripe. And yet they're completely different in stock, signage, and just general tone. All these display choices are visually compelling to me. 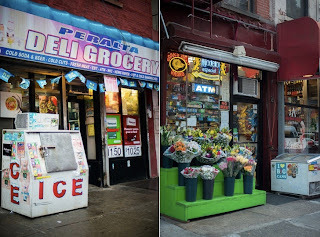 Q: How do you tell the difference between a bodega and a grocer's? A: Initially, I adopted the very loose Potter Stewart "I know it when I see it" type approach, which lasted for about a day of shooting in January after staring at one market for 15 minutes, freezing for no good reason, trying to decide if it fit. My criteria is that a bodega sells lotto tickets, beer, or cigarettes (preferably all three). Anything that advertises specials in the window not involving a deli counter is probably not a bodega--you don't need to have sales when your customers are desperate and it's 3am! If it's a gray area beyond that, which is rare, I go inside the shop. More than a deli counter, say, a meat counter, no dice. If they have a printed circular with coupons, it's a grocer. 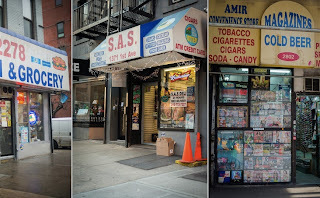 I've found the cigarette requirement really helps in these cases, most bodegas sell cigarettes and most grocers or ambiguous-looking health food markets, in my experience, do not. Newspapers could probably fit in, here, too. Bodegas tend to sell newspapers where grocers may not. But cigarettes usually work as my deciding factor. Q: How do you plan to get to every single one? There must be a lot of them! I think walking through the entire city is the only way to do it. I'm certain the entire list will have changed by the time I've finished. I know several of the shops I've shot in the past few months have closed already, I see new ones opening, and 7-11 stores keep popping up like weeds. My project is sort of a moment frozen in time, I guess. Wow, what an undertaking! And what a great way to get to know the city. "Watching these unique places get shuttered as 7-11 stores spread is, in my mind, like watching every random corner pizza shop turn into a Sbarro"
I haven't been in New York since December. Is this really happening? In the 'burbs, most or all of the 7-11s are franchised. Are the city stores corporately owned or are they owned by franchisees? If the latter, are the owners limited in the number of stores they can own? believe it or not......."bogeda's" are even disspearing in mexico etc. replaced by 7/11s. they dont call them by that name, i think that is domincano or puerto rican term. they are teeny grocery stores, selling a little of this a little of that. fresh baked bread & cakes in baskets or in a cabinet. cigarettes, body oils, some cosmetics, pens, notebooks, gum, candy, canned goods, sometimes some fresh vegetables. sodas, yogarts, cheese, ham in the refrige. paper goods. all crammed together. they even have stuff piled in a back room. the whole family takes turns working. they know what each customer likes. some of these places can be so small that there could be a line outside, especially when they deliver fresh eggs. 7/11s are the same all over the world. smelly, bitter cold air conditioning, harsh lighting, employees could care less. they dont have all the variety that a bodega has anywhere. also to mention that bodegas are cute, & have stimuating visuals. That's a cool project man but honestly Bodegas are way over priced. They are best for buying lottery tickets and cigarettes. Groceries are best bought at franchises unfortunately. The Bodega growing up in New York City was like hangout when we were teenagers, buying cigarettes, buying pot, etc the Bodega was like a neighborhood culture and central meeting spot. Now I guess in Manhattan they are used for cigarettes mainly, but in the Bronx and stuff you still see kids hanging out at the Bodega. Just an FYI- "bodegas" are Latino-owned. If it's not it's just a deli or grocer's. That's how you can tell the difference.